So many thoughts that I can't get out of my head! I've tried to live without you every time I do I feel dead. I know what's best for me, but I want YOU instead! I'll keep on wasting all my time! Over and Over, Over and Over I fall for you. Over and Over, Over and Over, I try not to! Over and Over, Over and Over, you make me fall for you. Over and Over, Over and Over you don't even try to! ~Three Days Grace, Over and Over. Plot: He can't help but watch him/her all day long, talk, and hang out with him/her. He really likes him/her. Then, his parents give him the news that he is off to go to a college that's far from home. After a while of thinking, he decides to run away, and take his crush with him. Over and Over he finds more and more reasons to love him/her. Over and Over the police are chasing him, trying to bring him back home. Kilik was resting underneath a large oak tree located in his front yard. He let out a sigh. He had just heard the news that he was going to a boarding school because his parents wanted him to join the military. The problem was, he had other plans on his mind and he seriously didn't want to go. He'd rather be a freedom fighter and say at home with all of his friends and family rather then leave. He looked up at the sun. Usually, she walked home around this time. He was waiting for her, even though he acted like he had no interest in her half the time. Atoli was walking home from school as she always did, checking her watch worriedly to make sure she didn't miss the bus that would take her the rest of the way. It was late in the school year, almost the end of the semester. She couldn't wait for break. She reached the bus stop and found that she was early, as usual. She heard the twittering of a bird and looked over. A pretty blue jay sat in a tree, singing his little heart out. That's when she saw him. L sat in front of the computer screen and popped another small cake into his mouth. He licked his lips and fingers before sipping some tea and scanning the news for cases. Mimiko walked up to L with a small donut box tucked neatly under her arm. "Here you go, sir," she said, setting it down. "Are there any cases?" While Mimiko had been part of the force for a couple years, she was still little more than a gofer. Well, was. That had all changed by a call to the boss's office, where she was told she would get to actually work on cases with L. Her first job? Buying donuts. Life was so unfair. L shook his head, his eyes glued to the screen. He dipped a donut in his tea and took a bite. Mimiko sighed and sat in a chair at another desk near L's. She was getting bored just sitting around here. She was the type who needed to get up and do something. Kilik saw Atoli's eyes meet with his. He wasn't sure what suddenly went through him, but he decided to run away. He had plan. He would leave today, but just go into hiding. That night he would talk her into going as well then really run for it. He didn't want to live the life his parents wanted to, despite his great combat skills and what not. He got up, entering his house. He then exited it a few minutes later, then took off into hiding. About an hour later, his parents noticed he was missing and frantically reported it to the police since they were extremely over protective. The bus came and Atoli went home, where she only recieved another barage about her grades from her parents. Her grades were never good enough for them, and she was never allowed to do what she wanted. She'd once gotten her ears pierced with some friends in middle school, but they'd made her take the cute little bird earrings out so the holes would close. Her parents didn't want a modern girl. They just wanted a girl who would get good grades, do what they say, and then get married and waste all the hardwork from school by being nothing mroe than a house wife. Angry, Atoli went to her room and refused to come down for dinner by saying she had to study. That was the best she could do to evade her parents' disappointment. The phone rang and Mimiko picked it up. "Hello, Police." She listened for a moment. "Yes!" She grabbed a pen and a pad of paper. "High school boy, Kilik. And how long has he been missing? Uh huh. Okay. We'll be right over. Please have a picture so that we know what to look for." She hung up. "L! We have a case. Missing persons report for a boy named Kilik." She pulled on her jacket. "His parents sounded worried. We should hurry on over." L nodded, "Hmmm....doesn't sound too interesting." He took one last sip of his tea and a bite of his donut before stepping off the chair and following her. The chief had said there was one other person on their team, and so Mimiko stopped by her desk quickly. "Hawkeye-san, we have a missing person's report to look into." It was a good thing, too. Mimiko didn't have a liscence because she didn't have enough money to buy a car anyway, and she didn't know if L could drive. Hawkeye, though, she'd seen drive to work every morning. She would have to drive. Kilik had managed to get to the outskirts of town without being pulled over and spotted by any police. He decided to enter an abandoned building, where he would wait until nightfall, to get the girl he saw everyday, then completely run as far as he could as he planned. 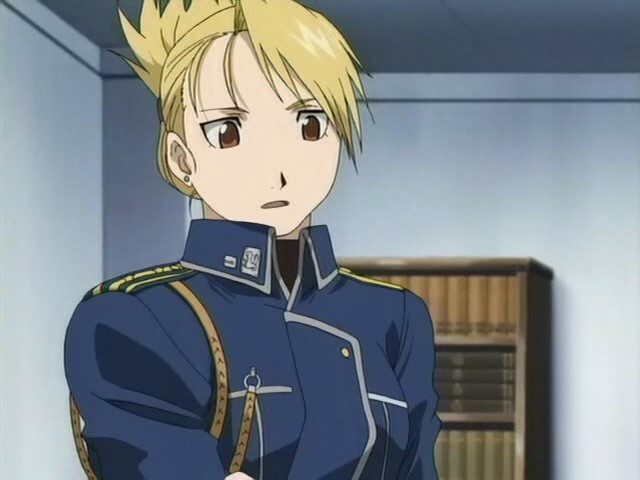 "And Roy, just because I'm not there doesn't mean you can slack off on your paperwork you better get it done," Riza said firmly, she knew that if she didn't call him everyday he would get behind or not do his work. She had just ended her phone conversation as Mimiko had approached her about a case, "of course, Mimiko-chan." She said grabbing a few papers for the questioning of the parents to get appearance, etc, and her gun. She then got into her car, and once loaded up, they arrived at Kilik's family home. When they got there, Mimiko knocked on the door. When the parents answered, she pulled out her badge and flashed it quickly, in case they didn't want people to know the police were here. "Can we come in?" she asked, as was normal. "He's about seventeen, with brown hair and eyes. He is toned and has a scar on his left cheek. He isn't the type of child to run away, nor was there any signs of him running away," She said summarizing the information, "so the parent's think that he was kidnapped. What do you two think about this?" L frowned, "That doesn't sound right. The boy has to have a reason to run away and on top of that, he is a very muscular boy, who could kidnap him?" "Um, when I walked in, I saw military school papers on the table," Mimiko said, thinking back to the things in the house. "Military school would be a good reason to run away, don't you think?" "I also thought that was rather supicious," She then listened to Mimiko's comment, "hmm. A child would run away from something like that. After all, you either want to join the military or not. Perhaps he ran away for that purpose. If he's toned like they described, he's probably very healthy, meaning that he could get far on just foot." Mimiko frowned. "Then how are we supposed to find him? If he can get far fast, that means there's a lot of ground to search." She wondered if they should contact the local media. L tapped his chin with his index finger, "Based on someone I know....I'd say check for a love interest." "But his parents said that as far as they knew he wasn't seeing anybody. If he was, they would have called there first," Mimiko said, reading over the notes she'd jotted down. L smiled lightly to himself, "Parents don't know a lot about their children, for instance, some don't even know their child is a killer." Mimiko stared at L a moment, then laughed nervously. "S-somehow, I don't think that's the case here." She looked to Hawkeye. "Do you have any ideas of where to start?" "L, you're a guy, where would you go to hide so you wouldn't have to join the military?" She asked as she began to scan the nearby streets, although she was for sure not expecting Kilik to be around there. She was looking for a clue of some sort that could lead to his whereabouts. L looked up at the roof of the car, his toes curling over one another, "If he's got an interest or a good friend. I would schedule a location to meet, instead of the usual address. He is probably somewhere he considers safe and off the radar." "Oh, but that could be anywhere!" Mimiko complained. "Can't we just track his cellphone signal or something? Teens can't go anywhere without them nowadays." This was a case of the pot calling the kettle black, however. Mimiko never went anywhere without her cellphone either.